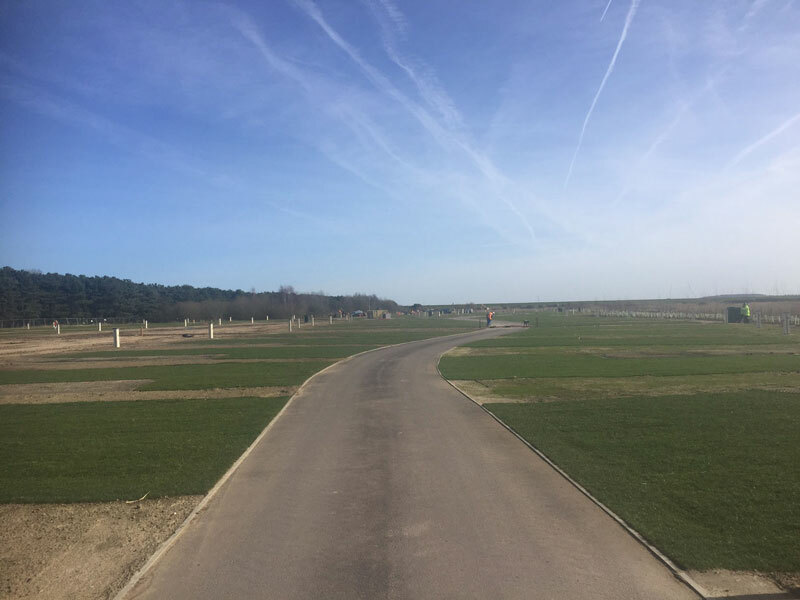 In this case study we see how a large landscaping project on the Norfolk coast has been completed on time and on budget using 17,000 m2 of hardwearing turf from Harrowden Turf Ltd.
Pinewoods Holiday Park in Wells-Next-Sea are proud holders of the David Bellamy Conservation Gold Award. They were insistent that the new 116 pitch extension to their park was eco-friendly and biodiverse. It also needed to be finished on time and to the highest standards of excellence. Chris Taylor of Warwick Taylor Landscapes explained why Harrowden Turf Ltd were selected to supply the turf. Given that works were carried out over the winter on the East Coast of England the contractors have done well to accomplish so much in such a short time. The construction team had the foresight to ensure there were no issues with access to what is quite a remote site. However Warwick Taylor did encounter with problems due to winter weather and the proximity to the sea. At times, excavations were affected by tidal ingress of water. A well-trained and experienced team with plenty of common sense prevailed. The site was completed on time and achieved zero snagging issues at handover.